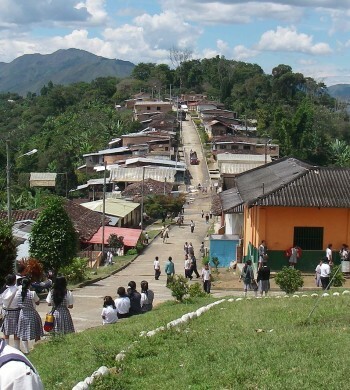 Asociación de Productores Egológicos de Planadas (ASOPEP) is a thriving organization of 168 coffee farming families, based in the idyllic town of Planadas. The department of Tolima is one of Colombia’s most productive coffee growing areas, but only relatively recently has coffee from Planadas caught the attention of specialty coffee buyers. Atlas’ first experience with Planadas coffee was in the 2008 “Coffee of the Year” program. That year, a small lot of Tolima coffee from the town of Planadas earned a 1st place victory over a field of not only Central and South American coffees, but East African coffees as well. The town of Planadas itself is just over 50 years old, established in 1966. The first groups to settle the area were from Antioquia and Huila, so it’s no great surprise that coffee production found a home there as well early on. Today Planadas is a bustling commercial center, where local farmers growing all types of produce in the foothills of the Cordillera Central bring their goods in for sale and distribution. Terrific elevation, warm days & cool nights and young, healthy trees all contribute to the fantastic quality coffee produced in and around Planadas. La Asociación de Productores Ecológicos de Planadas was founded in January, 2013, with the following mission: “To be known as an association that creates opportunities for the personal growth of its members, protects the environment, innovates in commercial business processes and is always in the vanguard of specialty coffee producers worldwide.” From our experience working with ASOPEP and their coffees, we can attest that their mission is a success. The 168 member families include 30 families where women are heads of the household and manage the farming operations. Educational capacity building workshops are at the core of ASOPEP’s program to ensure long term sustainability of their success. While many coffee growing countries struggle with keeping young generations interested in coffee production, an impressive 30% of ASOPEP’s farmer members are between 20-30 years old. Under the leadership of Camilo Enciso Suarez, a veterinary physician by trade, the reputation of ASOPEP for producing excellent coffee has grown by leaps and bounds since its establishment in 2013. Each member of the group receives extensive quality education and training leading to the consistently high-quality coffee we’ve come to expect. Education and youth involvement is one of the fundamental pillars of the group. Due to a historical lack of employment and education opportunities in Planadas, young people have had very few options. As a result, recruitment by the FARC was common. To rectify this, ASOPEP formed a youth collective that trains young people in cupping, quality control and barista skills along with business management and education in science and technology. Members of the youth collective also spend a fair amount of time traveling throughout Colombia participating in trade shows. Compelling young people to stay in the countryside instead of moving to the cities is a problem in many coffee producing countries. ASOPEP’s efforts were encouraging to see and undoubtedly effective. It’s wonderful during our visits to see so many kids clearly engaged and learning. By empowering youth, ASOPEP is helping to transform Planadas through education and optimism in the future. Along with a strong focus on education, ASOPEP facilitates internal cupping and barista exhibitions and competitions to build enthusiasm for specialty coffee. They’ve even produced consumer-oriented specialty coffee events to grown the community’s interest in buying and drinking specialty coffee. ASOPEP also recently obtained their Organic certification as well, making them one of only a small number of producers of certified Fairtrade and Organic coffee in Colombia. Strict attention to detail in cultivation, harvesting and processing ensure a bright, sweet, clean cup that’s complex as well as consistent. We’ve come to look forward to bright cherry, blackberry and mango from ASOPEP coffees, along with a syrupy mouth feel and resonant finish. Knowing their dedication and hard work, we’re excited to see the premiums they’re earning for their high quality take them even further!